Today is Ash Wednesday – the beginning of the 40 days of Lent for all Christians (not counting Sundays). During these 40 days of repentance we reflect on our lives, the things we have done and our transgressions; praying for forgiveness and observing specific days of fasting and abstinence from meat. Traditionally during Ash Wednesday we fast and abstain from meat, eating just one full meal. We observe Lent to mirror Christ’s 40 days in the desert where He endured temptation. In light of today’s abstinence and fasting I have prepared a meat-free dish that is healthy, tasty and very filling. Cook pasta as package directs; drain and set aside. In a deep skillet, heat the olive oil and the butter on medium high heat. Add the minced garlic and sauté for just 30 seconds. Add the cooked pasta into the garlic butter in the skillet. Toss well. Zest the lemon, cut in half and squeeze out 1/4 – 1/2 cup fresh lemon juice. Pour the lemon juice into the pasta and toss to combine. 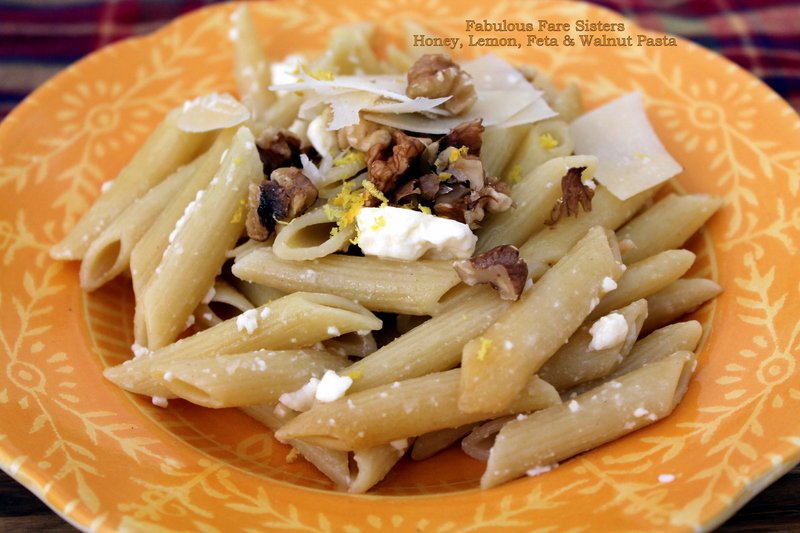 Pour the honey over the pasta and stir to combine. Add the feta cheese crumbles and toss well. 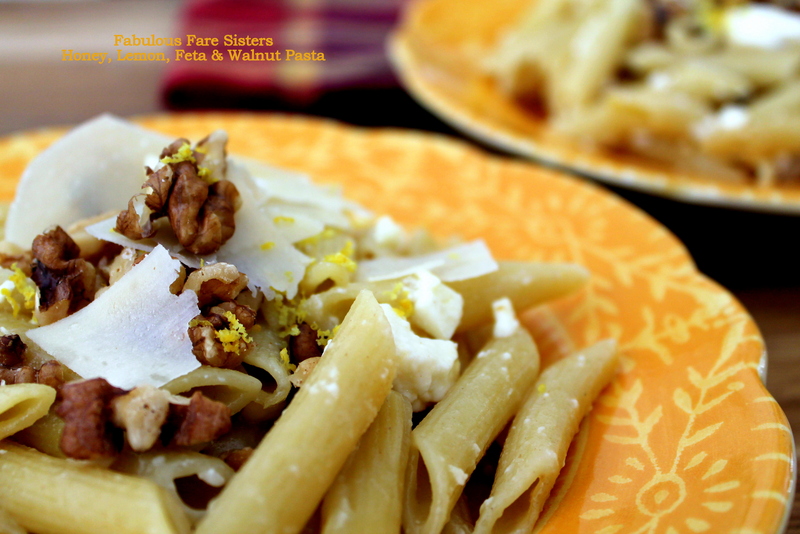 Scoop the pasta on plates and top with lemon zest, chopped walnuts & shaved Parmesan. This recipe has been shared at Senior Salon, Fiesta Friday and FoodieFridiy, along with Weekend Potluck, IdeaBox, Saucy Saturday and The Pin Party! Go check it out and then go visit some really great sites! This recipe looks great! I would love to try it. Pinned! Thanks for sharing at Inspiration Thursday! What I lovely pasta! I’m not missing the meat at all, much too busy loving how refreshing it sounds with all the lemon juice! I’m tempted to say that you’re giving abstinence a bad name with this delicious feast 😉 I’d certainly not miss the meat, especially the lemon is ingenious! 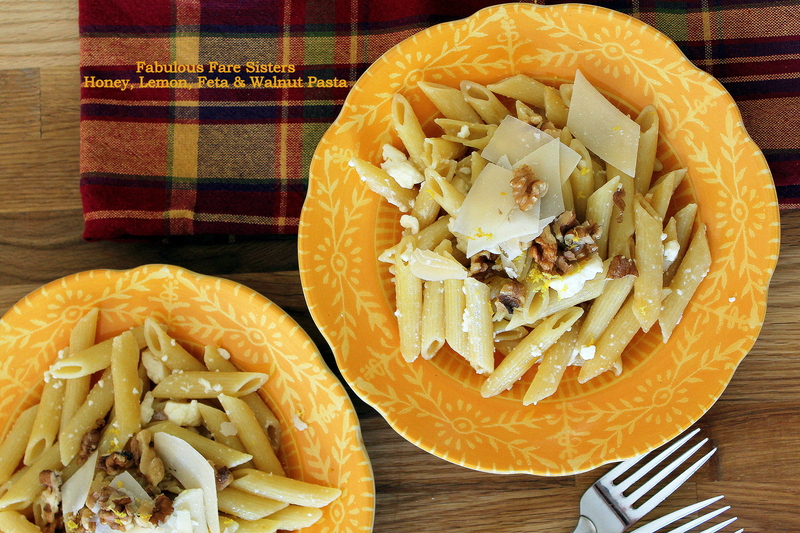 This pasta dish would be so perfect for dinner on a weeknight! Thanks for sharing with us! This looks fresh and delicious! Wow! I am so impressed by the flavors in this dish! Looks great Linda! God will give you the Strength dear Linda. Cheers. This is a great meatless entree. Yum this looks and sounds delicious!!! Oh – I want this now!!!!! YUMMMMM!